"Since cables have fallen or threatened to fall, some nearby houses have been evacuated and the passage under the cables and road to la Rosière, has been closed to traffic." The Lognan cable car to 1972m is the route up to some of the Chamonix Valley's highest slopes via the Grands Montets cable car to 3300m at the foot of the Aiguille Verte. Not good news at all; can't see that being back in action any time soon. We'll update this with Argentiere's plans for the season as soon as they're decided. 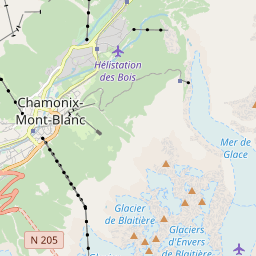 The Compagnie du Mont-Blanc has issued a press release about the fire https://us5.campaign-archive.com/?u=560b442b9e9207bf5d0b797ec&id=f635eaa3ae and a revised piste map https://www.compagniedumontblanc.fr/Marketing/plans/hiver18-19/Plan_Hiver_AGM_18-19.pdf?_ga=2.155371384.2103447816.1536679244-1272669653.1514047997 The loss of revenue for the coming season caused by the closure of the Grands Montets cable car is estimated at 10 million Euros. The Herse chairlift and the Plan Joran télécabine are also reported to have been damaged by falling ropes. Latest reports suggest that the machine rooms for both cable cars, which are both located below and behind the cabin docks at the Logon station are more or less undamaged, so it is conceivably possible that the instalations could be repaired in time for the 2019/20 season. However, as they are very old (they were built in 1962-63) and by modern standards have very limited capacity (730/700 passengers/hour). I personally don't think it's worth the trouble and expense, IMO a far better solution would be to knock the whole lot down and build something new. Despite being deprived of its two cable-cars, the Grands Montets ski area will be open for the winter season with access via the Plan Joran gondola, ski on the Lognan plateau with the new chair-lift giving access to the new beginners' zone as well as all the trails accessible from the Bochard gondola & the Herse & Retour Pendant chair-lifts. In addition to which, the top half of the Aiguille du Midi cable-car is out of action until December 2018. Following the devastating fire that took place on September 11th at Les Grands Montets, which destroyed the Argentière-Lognan and Lognan-Grands Montets mid-station, we would like to express our sincere gratitude to all the residents of the Chamonix Valley and the Mont Blanc region as well as to our customers, partners and, in general, to all those who love Les Grands Montets for their messages of sympathy and support. Despite the fact that we are not responsible for this incident, we want to address this situation and face the challenge head on. We are committed to doing everything in our power to partially open the Lognan ski area, if snow conditions allow it, during the weekends starting on November 17th 2018. Full or partial opening every day, depending on snow conditions, will begin on December 7th 2018. The summit of Grands Montets will, unfortunately, remain inaccessible by lift. We are aware that all visitors to the ski area will sorely miss the legendary "Top of Grands Montets" . When the judicial and insurance investigation processes are over, our team will start to get the ski area ready for the winter season. We also want to offer alternative options to the closing of the lift's second section. We are already planning ski touring routes together with the valley's guides and other organisations. These will start at Lognan or the Bochard summit and reach the Grands Montets summit at 3,300m opening up multiple off-piste opportunities (skiers and snowboarders must comply with all necessary security measures when in these areas of the mountain). We confirm that all the pistes from the Herse, Tabé and Retour Pendant chairlifts, as well as those from the Bochard lift will be accessible, as will be the Pierre à Ric home run. Without the "Top of Grands Montets", the playground will still be 90% of the ski area. Access to the ski area will be via the 10-person Plan-Joran gondola. This winter, the lift will also be open to return back down to Argentière. 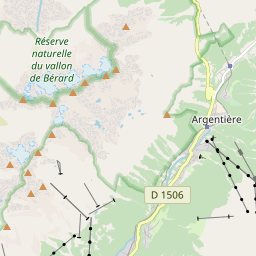 The Brévent-Flégère and Balme « Tour-Vallorcine » ski areas will open on December 8th 2018, depending on snow conditions. Les Houches ski area will open partially during the weekends starting on November 17th 2018, depending on snow conditions. Its full opening is scheduled for December 8th 2018. The Savoy, Vormaine and Planards ski areas will also open this winter. The Montenvers train will open every day from November 5th 2018. The télécabine and ice cave will open on December 15th 2018. The Tramway du Mont-Blanc will open on Saturday December 22nd 2018. If you can't manage to do a simple risk assessment and make sure there are fire mats and a watchman for routine maintenance how can you execute a major CP? On the positive side it will make for fantastic off piste skiing for those who are willing to tour to the top from the Bochard. Main downside is for that a lot of day tours will now become too big for most people if you have to add in another 6-700m of vertical. The chairman of the Compagnie du Mont-Blanc gave Chamonix town council an update on the situation at a recent council meeting. The Plan Joran gondola haul rope was damaged by falling cable car ropes and will have to be replaced before it can open. All the equipment required for the implementation of the Avalanche Control Plan was destroyed in the fire, this will have to be replaced before the area can open. Due to a dispute between "experts" (presumably insurance assessors) and the insurance companies CMB has not been allowed to start clearing the site. They plan to demolish the burnt-out buildings, but keep the machine rooms and the electricity sub-station that feeds the other lifts. In order for this to work they need gain access so that they can make them weather tight. Elsewhere, the Aiguille du Midi cable car haul rope will have to be replaced yet again (third time in 9 months. They hope to reopen it by the end of the year. 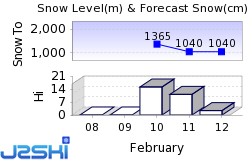 The rest of the lifts at Balme, Flégère and Brévent should open as planned. The price of the Chamonix Le Pass ski pass will increase by 1.95%, but the price of Mount Blanc Unlimited pass remains the same and now includes a day at the new wellness centre. Ski Hire Shops in Chamonix, Les Houches and Argentière. Fresh Snow is reported by 22 Ski Resorts in France, including Alpe d'Huez, Flaine, La Plagne, Les Arcs, Les Deux Alpes, Tignes, Val Thorens and Val d'Isère. At least 44 Ski Areas in France are reported to be open.